In Lattice, the words "In Use" may be next to a review template. This means that it is part of a review cycle or was part of a past review cycle. Templates in Lattice can be edited until they're associated with a review cycle. In Lattice, admins are not able to delete or edit templates that are "In Use." Editing these templates would compromise the integrity of the active/ended review cycle data. Templates [questions and answers] are associated to those who fill them out in a review cycle and editing them would mess that up. However, admins are able to "Duplicate" templates that are "In Use." 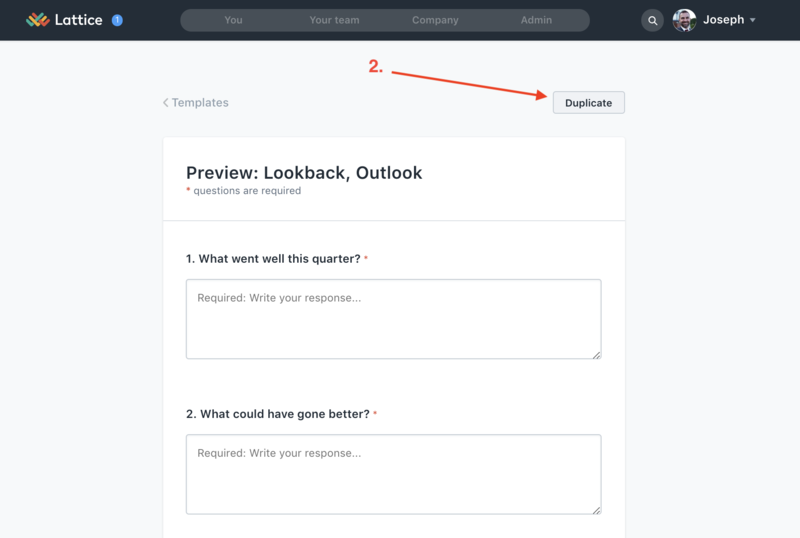 Duplicating a template is a quick way to make small adjustments/changes to previously used review templates. If the template that you want to delete or edit is only being used in a test review cycle, you can delete that review cycle which will free up the ability to edit the template.